An impressive mid 20th century sideboard. The top section with cupboard sliding glazed doors enclosed glass shelving. The lower section fitted three drawers flanked by a double cupboard enclosed storage and shelving. The cabinet features a warm Teak grain throughout, with five opening drawers. All of the drawers feature elegant moulded and inset circular drawer pulls. The whole piece is raised upon a tall Beech wood plinth base, with stretcher detailing. Practical and versatile piece. Single opening cupboard door with all the the rear being open. Designer: Danish Design. Date: 1990s. Victorian period, mahogany 2-tier buffet, Circa 1870. This buffet with rectangular top tier superstructure with rounded corners and bevelled edge, carved gallery at the rear, supported by ring turned gun barrel columns, over cabinet with double arched panelled doors, with working lock and key, and single interior shelf. A design classic made in stunning satin walnut. The top drawer is lined with dark brown baize. Without doubt a genuine piece of quality mid century furniture. Material: Satin Walnut. Date: 1960s. Condition: Excellent with minimal signs of age related wear. Mid 20th Century (c1970) teak glazed cocktail sideboard. The fall flap enclosed mirrored interior and lighting and flanked by sliding glazed doors enclosed glass shelving. Fitted three long drawers below with solid interiors flanked by cupboard enclosed shelving and storage. A beautifully and simply stunning teak sideboard designed & manufactured by White & Newton of Portsmouth circa 1970s. A super nice piece with nice details, super thick drawer fronts, solid teak with dovetail joints. The sideboard is finished in Rosewood with a grain rich in detail, particularly to the top and front. The piece features four opening drawers, all with elegant moulded drawer pulls. The piece is ideal in size to be used as a side cabinet or TV stand, and is raised upon four turned Beech wood legs. A beautiful shelving unit designed and produced by the renowned DutchTomado shelving makers. The clean lines and corners give it a contemporary feel. A wonderful clean example of a modern antique classic. On the front it is marked with the owner's initials, and the year 1863 with flowers in the background. Iron handles on each end. Mahogany Bar Cabinet. Circa Early 20th Century. Unusualrosewood sideboard withh ot plate in t op (n ot i n us e). 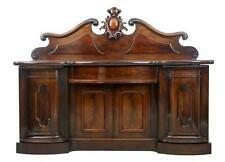 The sideboard features a rich and detailed Rosewood grain throughout. The piece has two opening and lockable doors to the front (key provided), which reveals two adjustable shelves within. The whole piece is raised upon elegant turned and tapering Beech wood legs. A te ak sideboard fo r yo un ge r.
The sideboard is in very good to excellent condition, the sideboard has been loved and well card for, it's really clean and looks great. The joints are all good and solid, the teak is very good, strong colour and grain. Designer: E. Brouer. 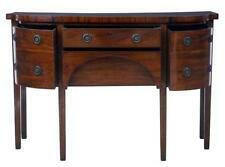 The sideboard is produced from Teak and features a nice warm grain throughout. There are two opening drawers to the top section with two opening cabinet doors below, revealing internal adjustable shelving. A simply stunning 1960s Teak Danish sideboard by Avalon Furniture. The grain to the top of the sideboard is amazing, really active grain pattern. The sideboard sits well and has no wobbles. The grain to the front is beautiful too, it's book matched and runs horizontally across the piece. Depth : 45 cm - 17.72 in. Width : 76 cm - 29.92 in. Danish sideboard designed by Arne Vodder for HP HANSEN. Sideboard with a simple modernist form with an arched front and slim vertical handles. Sideboard has a sliding door, interior with shelves and four small drawers on left side. A stunning 1960s Jentique Danish style teak bureau. A simply beautiful piece of classic mid century furniture from the unique and wonderful Jentique manufacturers. Depth: 41.0 cm. The fronts of which cross banded in satinwood, standing on tapered legs finishing on moving castors. 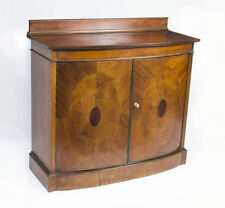 A charming Edwardian Sheraton style mahogany drop centre sideboard with the drawers. Edwardian Sheraton Style. A simply stunning 1960s Teak Danish sideboard by Beautility Furniture. The joints are all good and solid, the teak is very good, strong colour and grain.The grain to the top and front of the piece are stunning, the top of the sideboard is in very good condition. Deeper and less wide than a normal sideboard. In superb condition. Very solid, well made and substantial piece. Date of manufacture: 1970’s. G Plan labelled. Manufacturer: G Plan. Signs of minor wear consistent with age and use. A simply stunning 1960s G Plan Quadrille teak sideboard. The sideboard is in very good to excellent condition, the sideboard has been loved and well card for, it's really clean and looks great. The sideboard sits well and have no wobbles. 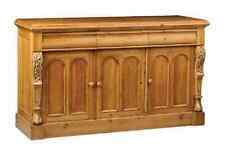 Attractive triple cupboard, triple drawer sideboard. Hand painted scenes to each of the doors and drawer fronts. Max Depth: 48cm (19"). We will get the best possible service and cost for you. Highlands & Islands. Item: sideboard. Material: teak. Age: 1960 - 70. Note: very good condition. A simply stunning 1970s rosewood and teak Danish small sideboard / cabinet by Cado Furniture. The joints are all good and solid, the teak is very good, strong colour and grain. The grain to the top and front of the piece are stunning, the top of the sideboard is very good but does have a few signs of use, nothing detracting, it's been rewaxed and looks great. A simply stunning 1970s teak Danish sideboard by Stonehill Furniture. The joints are all good and solid, the teak is very good, strong colour and grain.The grain to the top and front of the piece are stunning, the top of the sideboard is in very good condition. A beautiful Danish sideboard in an excellent original condition. Four drawers. A really great design, a classic Danish sideboard that is a very useable piece of furniture. rich tones to the teak offset nicely by the rosewood detailing around the edges and base. Impressive Mid Century Carved and Lacquered wood Illuminated Chinoiserie Bar Cabinet. Possibly, made in France during the 50s. Material: Lacquered and Carved Wood. Circa: 1950s. It is illuminated from inside with 4 bulbs, which are exactly illuminating 4 "flowers" over the mirror. in the last picture, you can see what i am trying to explain. 1950/60 RETRO STUNNING BLACK AND PLASTIC RAILWAY RACK / COATHANGER. A simply stunning 1970s Nathan circles teak sideboard. The joints are all good and solid, the teak is very good, strong colour and grain.The grain to the top and front of the piece are stunning, the top of the sideboard is in very good condition. A stunning Uniflex early 1960s Q Range Teak sidebord. the top is very nice with no issues. A rare design, I've not has this Uniflex model before. The cut away handles and very stylish and the two cupboard doors have push catch opening so there's no handles to keep it very miminal. A simply stunning 1960s G Plan teak sideboard from the Scandi range. The sideboard is in very good to excellent condition, the sideboard has been loved and well card for, it's really clean and looks great. Designed by Danish designer Gunther Hoffstead it has very nice detailing such as the leather handles and the interior being lined in sycamore. A simply stunning and rare 1960s Teak sideboard by Uniflex Furniture. The sideboard is finished in Rosewood with a grain rich in colour. The piece features four opening drawers, all with elegant moulded drawer pulls. The piece is ideal in size to be used as a side cabinet or TV stand, and is raised upon four turned Beech wood legs. A beautiful teak Danish Style sideboard by Austinsuite Furniture. The sideboard sits well and has no wobbles. The handles are styled from solid teak with a beautiful grain to each drawer, the legs are a nice tapered shape and made from solid teak. A simply stunning 1970s teak Danish sideboard by Jentique Furniture. The joints are all good and solid, the teak is very good, strong colour and grain.The grain to the top and front of the piece are stunning, the top of the sideboard is in very good condition.